This could be the beginning of a major trend — Asian fund flows just quadrupled, on a weekly basis, according to Citi Investment Research. Note this comes on the heels of a Deutsche Bank survey that said almost half of the investors planning to invest new risk-taking money (into hedge funds) plan to invest in Asia. 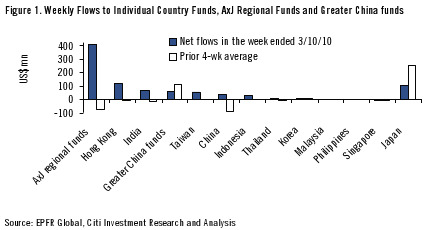 Asian equity fund inflows gaining upward momentum — Inflows to Asian funds quadrupled WoW to reach US$754m in the week ended last Wednesday. This was the biggest inflow in three months, and from a short-term perspective, inflows have been gaining upward momentum (Figure 2). With the results season around the corner, and the consensus now forecasting 19% EPS growth for 2009E, we think foreigners are likely to put more money into Asian funds as they hope for an earnings-driven rally.